The past 100 years have proven that the possibilities for what a concrete masonry unit can be are endless. Throughout this issue, we've seen evolution in production methods, colors, finishes, structural usage and veneer usage, but that's not all. CMU can be produced and designed to enhance a building's performance in myriad ways – from safety to acoustics to energy efficiency to aesthetics. It has been adapted to be more environmentally-friendly and more mason-friendly, improving construction methods and times as well as improving the mason's job-related ergonomics, health and safety. CMU has even come out of the wall into vertical and horizontal landscape design. Here are further examples of how producers never stop innovating. IMMERSIVE MASONRY DESIGN SOFTWARE AGENCY Just as the construction industry is currently being overhauled by digital technology, the masonry industry is keeping pace. From 3D models, to laser scans, to robotics, we see incredible efficiencies in all areas of masonry construction, even custom. 3DiQ Inc. is leading the charge in the development of the emerging digital era for masonry. Masonry is a perfect fit for a digital world due to its modular nature. Innovative software that understand the rules of design, production and installation is having an increasing impact on how walls and enclosures are built. MASONRY iQ, intelligence in design, represents a huge step forward in the design of masonry. Revit, the BIM authoring tool from Autodesk, with the largest market share is only partially supported for masonry products. Masonry iQ supercharges Revit so it can deliver a fully integrated BIM solution. 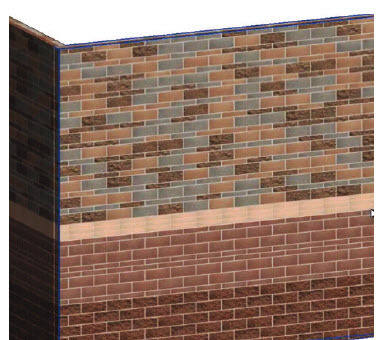 Using generative design technology, masonry models created in Revit understand bond patterns, create the proper sections and plan views and give designers insight into masonry layout that is typically not explored until the contractor is on the job site. NEWEST TECHNOLOGY Masonry model married to laser scan with precise location and scale. Several locations were identified where concrete needed to be modified for proper installation when scan was clashed against the model. Exact measurements can be made between existing field conditions and modeled elements yet to be installed. Due to design’s twisting nature, molds for panels were machined directly from the 3D model rather than from traditional fabrication drawings. TECHNICAL CAPABILITIES Seeing is believing, Seeing a highly detailed construction model in a virtual space is the power of BIM. Many new features are instore for Masonry iQ in 2019. Movement joints will be programmed to follow NCMA Tek Note rules. The MUD (Masonry Unit Database) will soon be integrated allowing specific unit geometry and properties to be implemented. Structural rebar schedules will soon be enabled allowing engineers to study reinforcement in great detail. Complex wall properties like U factors will be calculated by Masonry iQ allowing energy compliance to be quickly assessed. If you deal with the technical side of masonry design, then you will welcome the arrival of digital support. Render your design in Revit in minutes with your custom pattern and the actual materials you will specify for the masonry. Yes, Masonry iQ can do that! INTEGRATIVE SOLUTION Maybe you are more interested in the artistic side of masonry than the technical side. Well you will appreciate the rendering support offered by Masonry iQ. Not only can patterns be created and explored, but materials from local producers can now be mapped to models giving a photorealistic rendering of masonry buildings in design models. This enables designers and owners to see masonry in all its glory very early in the design process. Want to see a building in a couple of different materials? Masonry iQ can do that in minutes. Want to show your design to an owner in VR (virtual reality)? 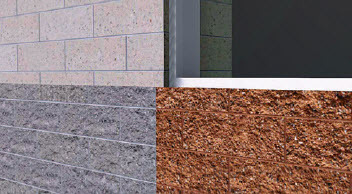 Masonry iQ will give you models with high resolution complete with a range of color and texture, integrally colored mortar options and bump maps that are sure to impress. MASONRY IQ BUILD Intelligence in construction. 3DiQ Inc. isn’t just working on design solutions. Masonry needs better support on the production and installation side as well. Masonry iQ Build, due to debut in 2019, will provide that support. Masonry models have proven to have tremendous value in generating material orders, staging production and delivery to site, coordination and clash detection with other trades, integration with laser scans and so many other processes in today’s construction industry. THE BOTTOM LINE? You need models to capitalize on the future. 3DiQ Inc. is working to deliver those models. Stay tuned. The future efficiencies of masonry, complete with support, is closer than you may think! 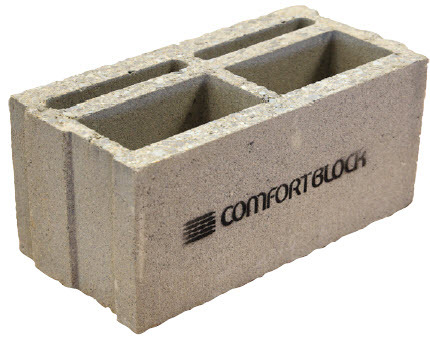 Comfort Block has taken the idea of a traditional 8" block and completely transformed it into the innovative CB-8. Designed as a full dimension unit of 8 x 8 x 16 eliminating the area required for traditional mortar. Instead, a spray foam adhesive is used. Mortar elimination reduces shrinkage. PRECISE DIMENSION Much like many European block designs, Comfort Block is manufactured to the most precise dimension possible and ground to exactly 8" high. This ensures the wall remains level during the entire construction and allows the whole wall to be assembled using a ready-to-use masonry adhesive, once the base course is complete. SPEED The simplicity allows the CB-8 system to install incredibly quickly. Installation rates of 150 block per hour can be achieved with a two-person team. The adhesive, 5X stronger than mortar, is completely cured in 24 hours. Grouting can be done within one hour of wall completion. FINISH The CB-8 has also been designed to eliminate the need to use drywall. A narrow channel designed into the block accepts a standard metal electrical box. The electrical box is installed after the construction of the wall, which eliminates the need for masons to run electrical conduit in the wall as it is laid. This offers flexibility to the builder and electrician as they can add or subtract boxes on the fly. Once the wall is complete, a rendering such as a sand cement, plaster or even veneer, finishes the project. Smart Dynamics of Masonry advertising information. OPPORTUNITY for experienced marketing professional to work with national and local associations in promotion of SMART|dynamics of masonry.